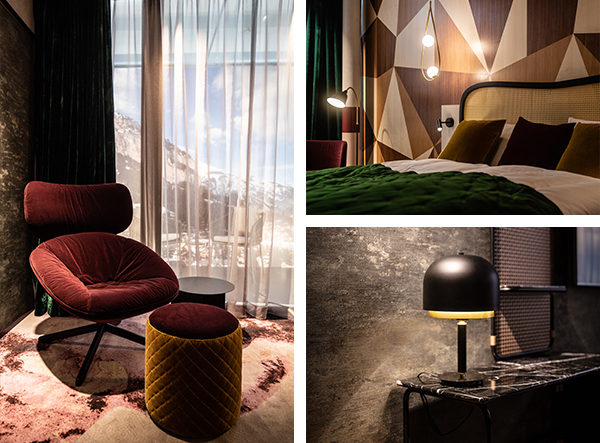 Berlin, May 29, 2018 - Come this December, the picturesque Swiss village of Flims will welcome a modern Alpine retreat in the form of The Hide Hotel Flims. Located in the eastern region of the Swiss Alps, where skylines are dominated by unspoiled landscapes, the 47-room property will attract intrepid adventurers looking for some mountain magic. This newcomer will stand as a beacon of welcome, inspiration, relaxation, and social connection—a hidden gem among the crystal-geode stones that make this corner of the Swiss Alps a UNESCO World Heritage site. Here, guests can expect not only a good dose of winter and summer thrills, but also a deli, a restaurant, a spa, an outdoor terrace with views of the slopes, and a fully-fledged kids center. 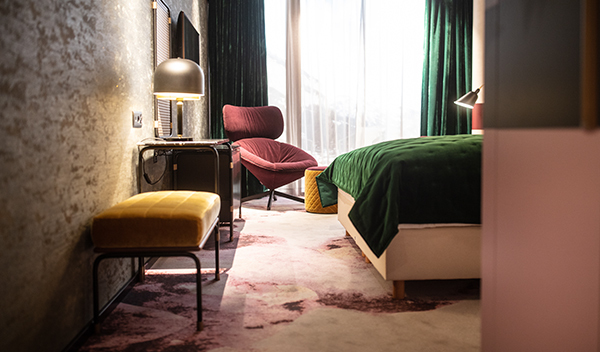 Inside, the hotel’s 47 rooms and public areas have been conceived by Erik Nissen Johansen of the firm Stylt Trampoli AB, a Norwegian visionary and artist with a passion for engaging design experiences that focus on storytelling. A living room lobby greets guests, outfitted with a fireplace, lounge, bar, and library—ample cozy nooks where staff can consult to create idyllic excursions. Defined by a warm and generous approach to hospitality, a mountain concierge is on-hand to facilitate any equipment rentals, activity planning, and to provide valuable insider knowledge of the area. Not forgetting about the younger mountaineers, a 2000 square-meter ‘’Kindercity’’ boasts chocolate and bread workshops, exhibitions, a dinosaur workshop, a robotics lab, a driving school, and professional childcare. Outside, one discovers a winter wonderland featuring 235 kilometers of pistes, while summer dazzles with crystal-clear lakes and the adventure-rich “Swiss Grand Canyon”. Flims is a rare Alpine resort, a place that retains a village feel while still catering to an international crowd seeking supreme powder, mountain biking for all levels, and spectacular hiking conditions. And after the thrills have been sought, a boutique cinema with four rooms, world-class shopping, and a 1000 square-meter spa beckon, all in the setting of a relaxed refuge.